What, you thought the Dyson deals were done? Fat chance! It’s still Cyber Week 208 which means you still have time to score deep discounts on Dyson’s best vacuums. And today, there’s one deal in particular that we want to highlight. 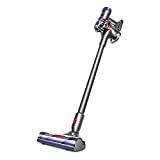 If the new Dyson V10 Motorhead is still too rich for your blood on sale for $350, definitely check out Amazon’s current deal on the Dyson V7 Animal Cordless Stick Vacuum Cleaner. It normally sells for $400 and it’s worth every penny, but right now you can get one for just $240!